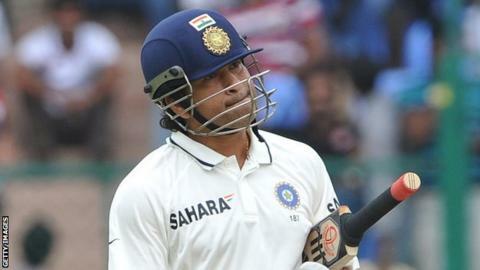 Indian cricket great Sachin Tendulkar has admitted for the first time that he is considering retirement. The 39-year-old batsman, who is the leading run-scorer and century maker in Test and one-day international cricket, said he would decide his future on a "series-by-series" basis. However, he said he expected to play in the home Test series against England in November and December. "I don't think I have plenty of cricket left in me," Tendulkar said. "I will go by what my heart says. At this moment, my heart says I am OK."
Asked if he has been thinking of retirement, Tendulkar added in the interview on Indian television: "Of course I have been." Tendulkar, who has scored more than 15,000 Test runs at an average of 55 since making his debut in 1989, has gone 25 innings without making a Test hundred. He was also clean bowled by New Zealand three times in a row during the series in India, failing to make any significant contributions. Before that series, any talk of dropping Tendulkar, the first player to score 100 international centuries, had been taboo in India. However, some former India players and captains now say it is time for him to make way for a younger player. Tendulkar insisted he does not need to make a decision "right now", adding: "When I play in November, I will reassess things. "I am still the best judge of what happens to my mind and body. When I feel it is time, I will take a call. It is going to be a tough call nevertheless, because this is what I have been doing all my life." England will play four Tests against India, the first starting in Ahmedabad on 15 November.